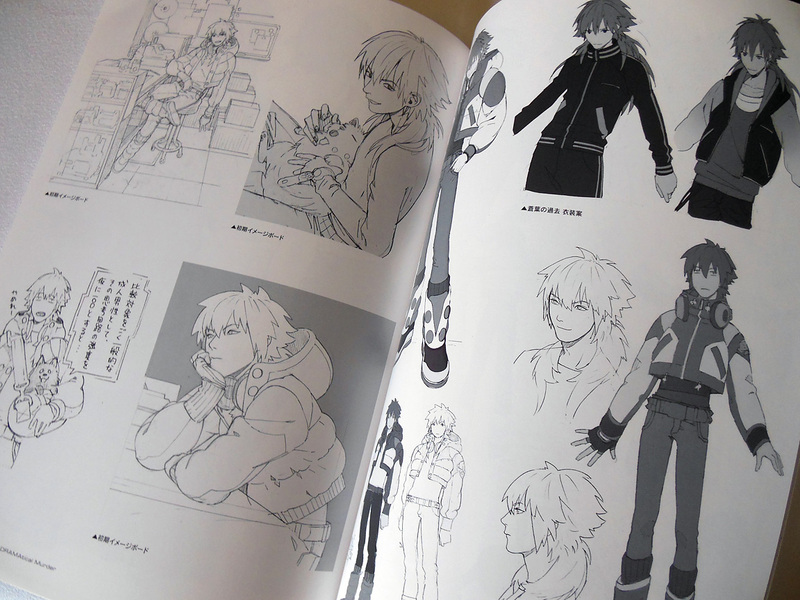 These detailed illustrations of four of the major characters were done for B’s-LOG, a popular Japanese magazine that focuses exclusively on Boy’s Love games. 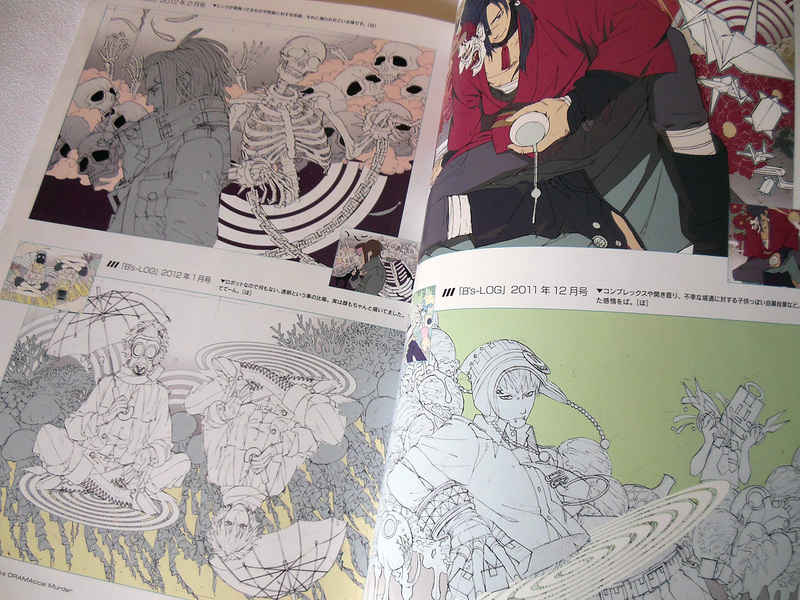 The next couple of pages of artwork were published in Cool-B, another BL magazine. 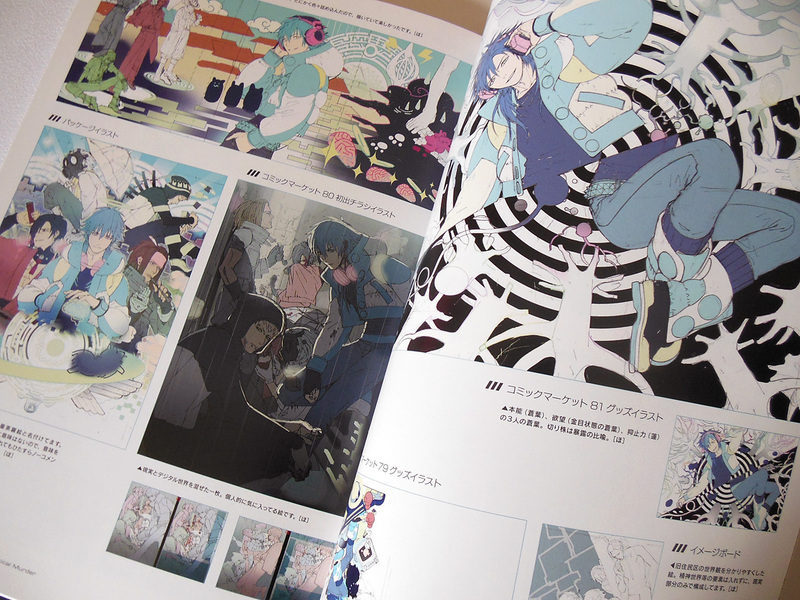 I think it’s interesting that a great deal of the art they put in the book isn’t completed CG work, but rather works in progress. There’s a lot of rough pencil drawings with only the color flats applied. The muted pastel hues used throughout the game are an interesting contrast to the underlying darker themes that Nitro+ is famous for delivering in the plots of their totally brilliant visual novels. 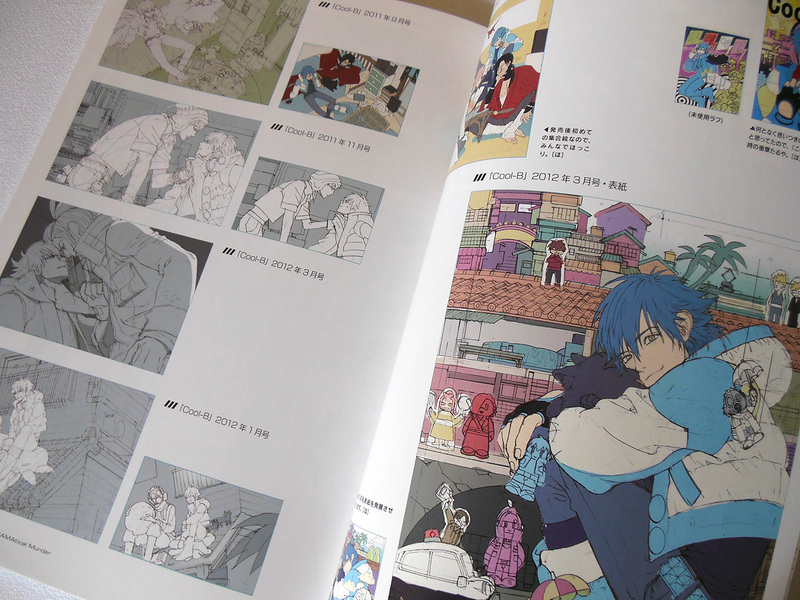 I usually associate cyberpunk with shades of night-time pierced by high-tech neons, but the daytime scenery in DMMd is deceivingly lively in its brightness until Aoba reaches Platinum Jail. Later we get to the building architecture and interior designs. 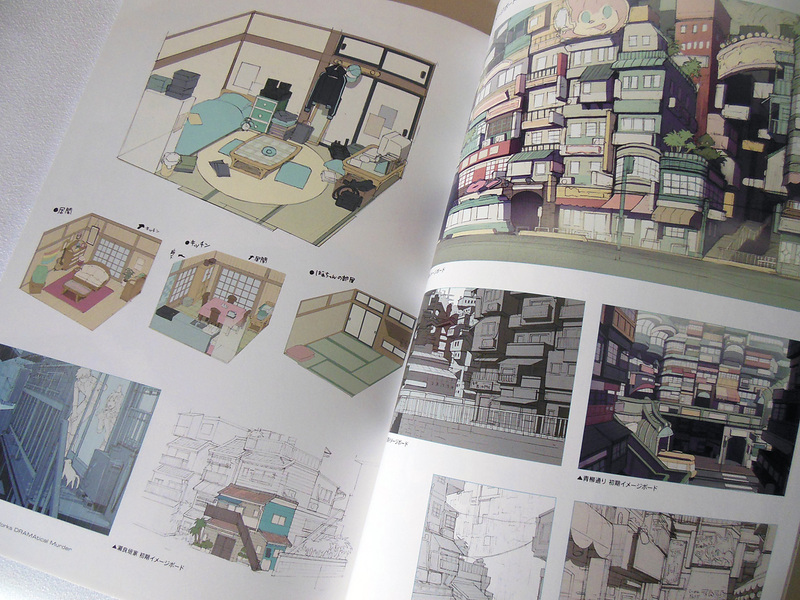 Here you can see a bit of the former resident’s district and the inside of Aoba’s home. I love that instead of simply printing the background paintings we see in-game, they’ve chosen to show us a three-dimensional view of these interiors! 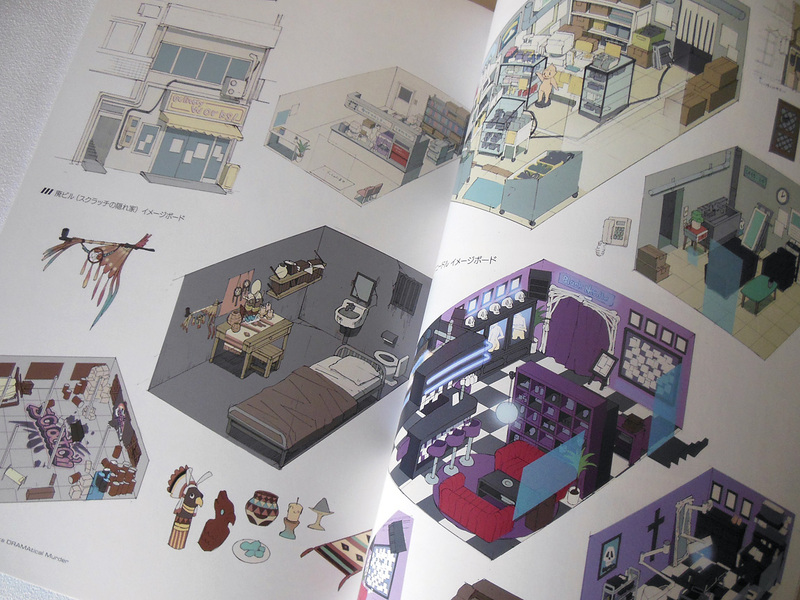 Mizuki’s tattoo parlor, along with the junk shop Heibon’s interior and exterior are also among the locations featured. Additionally, there are some designs for the smaller objects on display in their respective rooms. 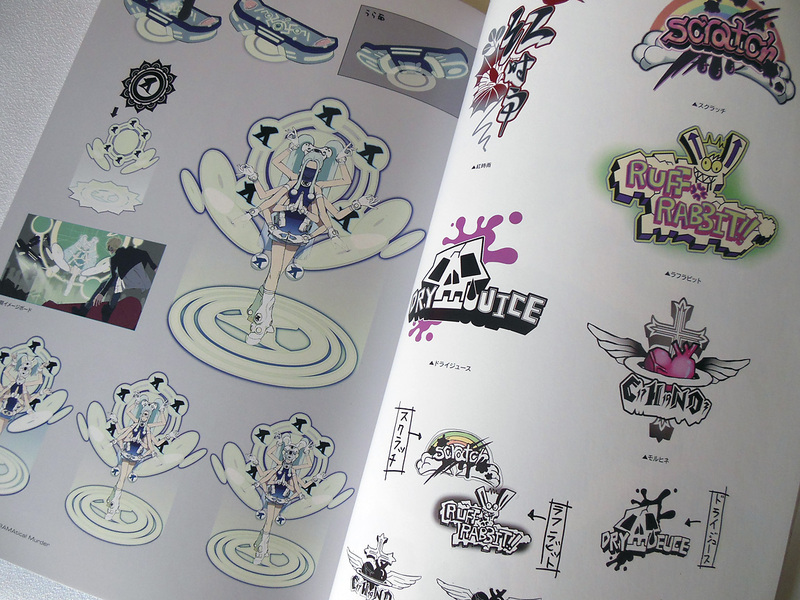 The graffiti logos of all of the Rhyme and Rib teams are presented alongside the detailed design of Usui, the enigmatic All-mate who hosts the Rhyme games. 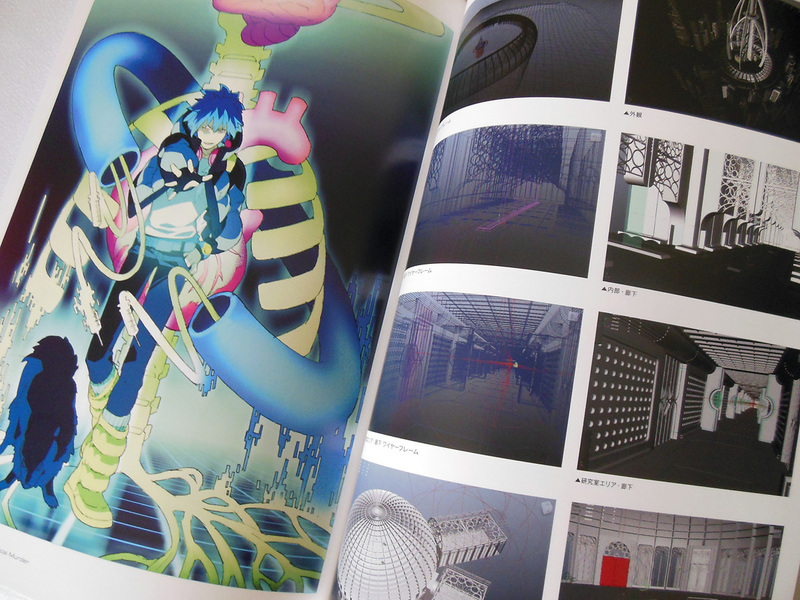 3D renderings of the architecture in platinum jail are on the right, followed by one of the book’s only full-page color illlustrations of Aoba and Ren inside of Rhyme. 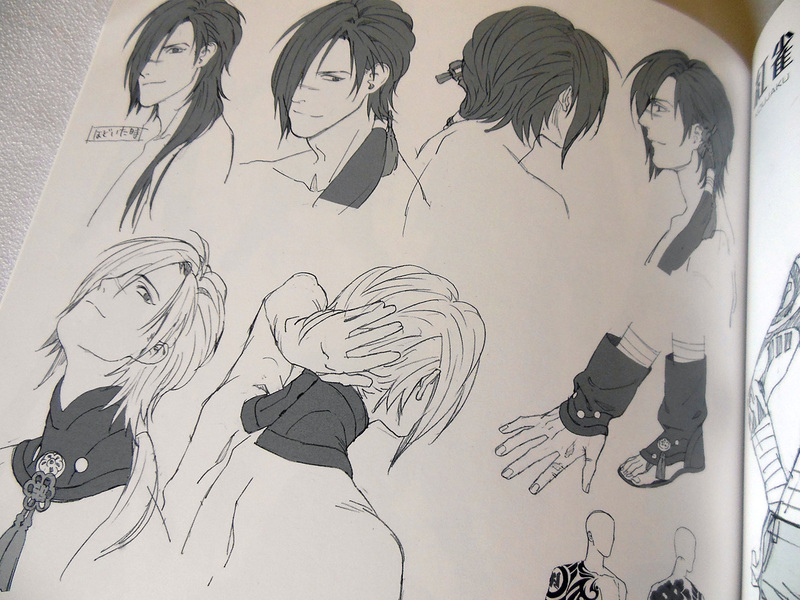 What game artbook wouldn’t be complete without character settei (model sheets)? All the characters and the details of their costumes near the end of the book, and I’ve taken photos of a few of my favorite pages to share! 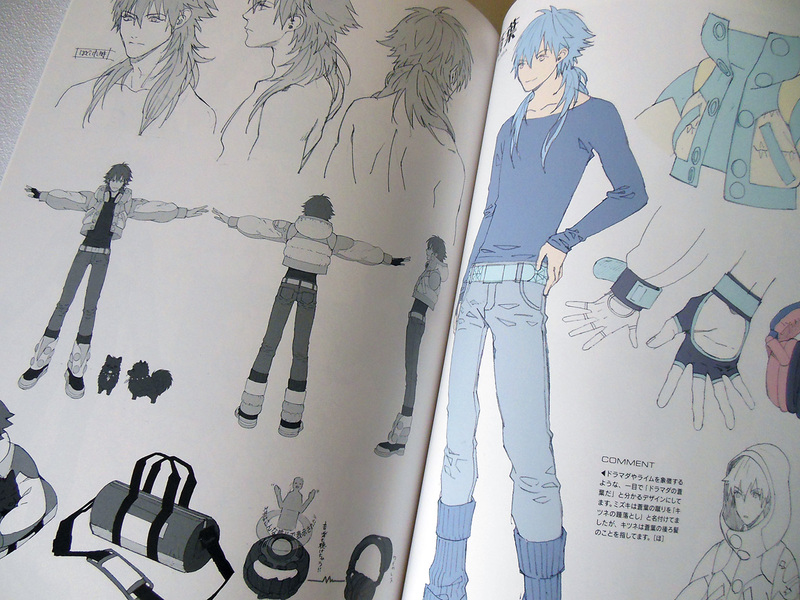 Being the main protagonist, Aoba gets a bit of extra lovin’. 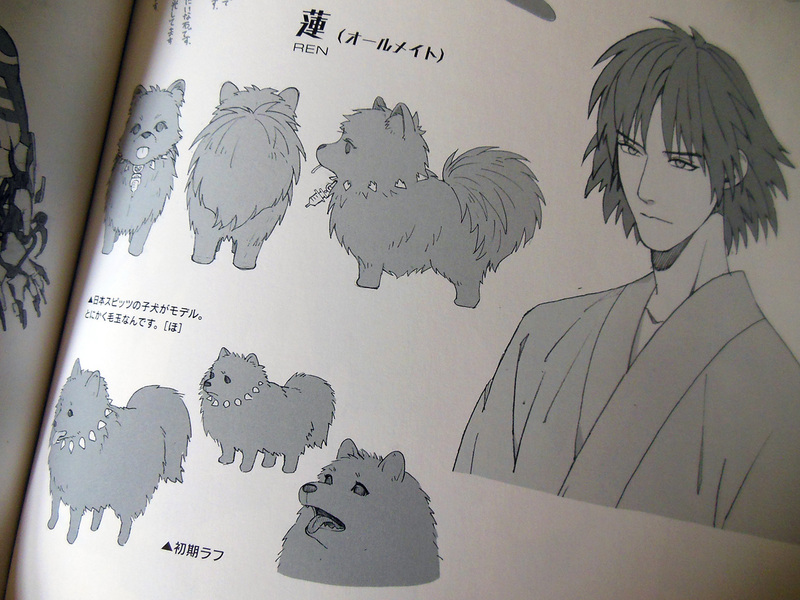 Koujaku is, as usual, lookin’ fine as hell. Ren: fluffy, adorable and handsome. Is this book really over 300 USD? I would gladly buy it, but 300$ is way too much, no offense. 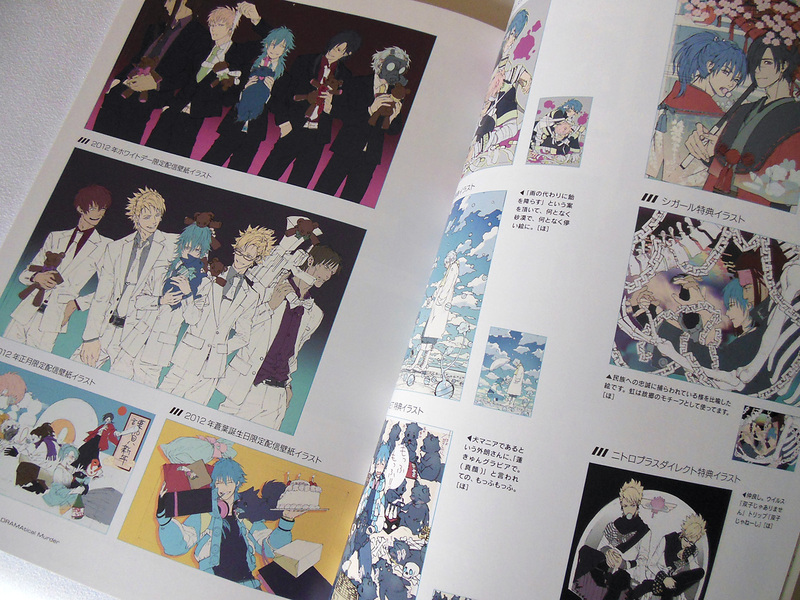 I think I’d gladly go as high as 90$ for DRAMAtical Murder, and I’m not trying to be disrespectful- but I can’t afford stuff like this. I really, really want this book, though. 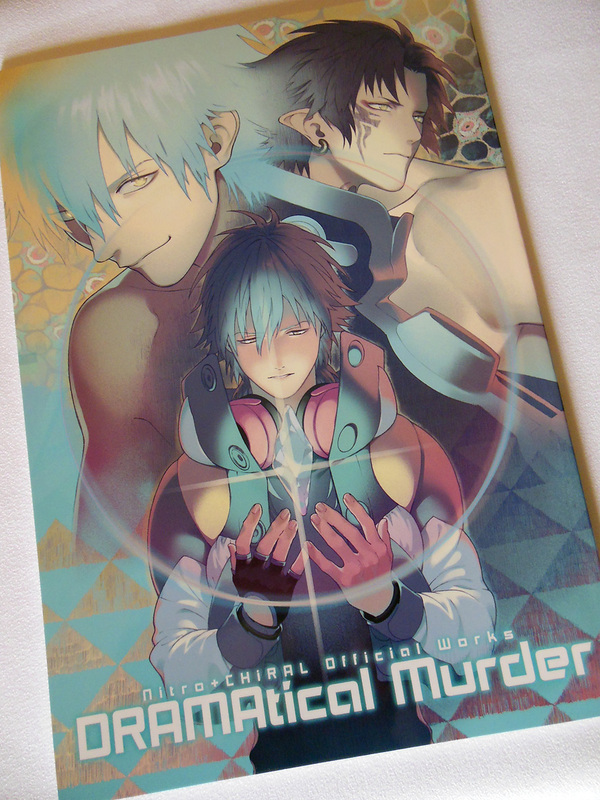 I love DMMD and the book looks so high quality and a fantastic reference for fanart or art practice. No way! Who is charging that much for it? There’s a bunch up on eBay right now for $29.99.